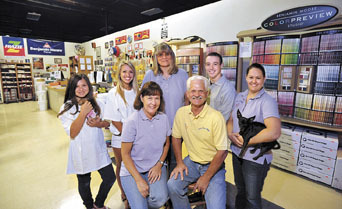 Established nearly 30 years ago, Santa Ynez Paint is the only store in the Valley specializing in house paint and related sundries. Here, shoppers find top-grade Benjamin Moore products and a comprehensive selection of brushes, rollers, pans, tarps, paint thinners and sponges for creating faux effects. You can get a one-on-one lesson on painting, ask any questions you want, pick a color or have us do custom matching. If you find a piece of carpet you like, we can match it. Open M-F 7:30 am-4:30 pm; Sat. 8 am-1 pm.